The City of Cape Town has announced that residents will be able to consume more water as of 1 December. The City will ease water restrictions from Level 5 to Level 3. This means that Capetonians can use 105 litres a day, up from the previous 70 litres a day. This decision follows on from the National Department of Water and Sanitation’s latest water assessment. Water tariffs in the Mother City will also be lowered as a result of this move. 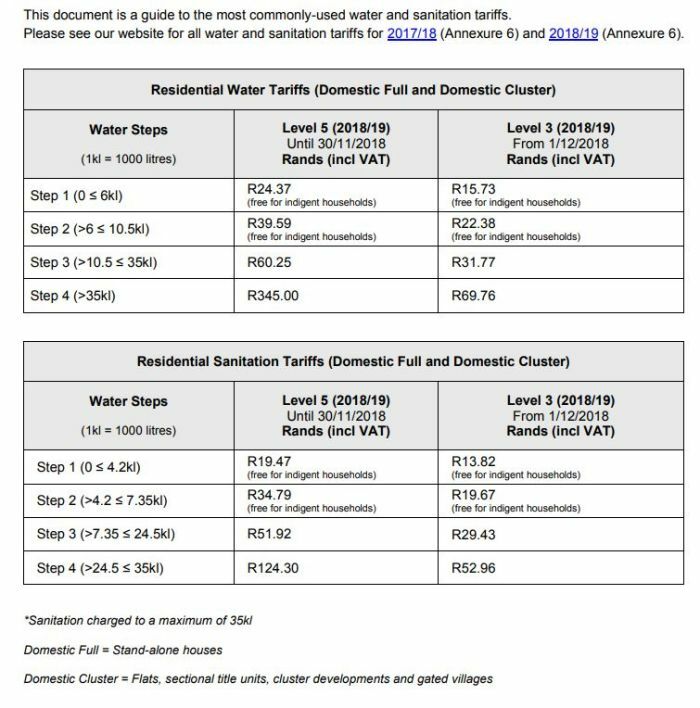 IMAGE: Water tariff changes as illustrated by the City of Cape Town website. Level 3 water restrictions were last enforced in Cape Town two years ago. In October this year, the City dropped restrictions from Level 6B to Level 5, after dams reached almost 75% capacity. Capetonians have been encouraged to continue with a water-wise approach while the city recovers from the drought. Click here to read more about Level 3 restrictions and what they mean. Here's what the big changes are from level 5 to level 3.